The Mexican government has honoured one of the founders of the Chieftans with an award to recognise the contribution he has made in strengthening ties between Ireland and Mexico. The 'Ohtli' Award is the highest cultural award that Mexico gives to citizens outside of the country. 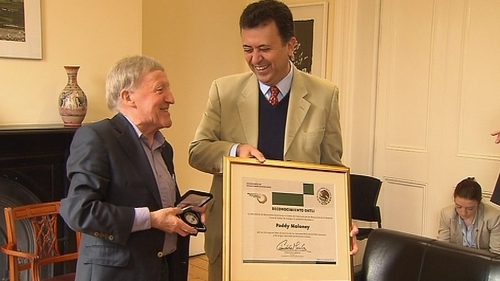 Paddy Moloney is one of only three Irish people ever to have received the honour. Mexican Ambassador to Ireland Carlos Garcia de Alba said Mr Moloney received the Award in recognition of his strengthening of Mexican and Irish ties. In 2010, The Chieftains released the album 'San Patricio'. The collaborative album was inspired by the story of soldiers in the Mexican American war, led by Sgt John Reilly, who deserted the US Army and fought for the Mexican side as the St Patricio Battalion. “John formed his battalion, and fought on the Mexican side until the bitter end,” Paddy said. Taken by the story, Mr Moloney fused the sounds of nine regions of the country along with the Chieftains own music. The award will be officially presented to Mr Moloney tomorrow evening to coincide with Mexican independence celebrations. He said this award means a lot to him. He added that the album took years to research the music of Mexico from the 19th and 20th centuries.